When Steven Spielberg’s Jaws became a surprise global phenomenon, it ensured two things – that the director would go on to bigger endeavors and that Universal would do its darndest to plague Amity with future great white shark problems. Thus, returning writer Carl Gottlieb and new recruit Howard Sackler (who, to be fair, did some uncredited touch-ups on the first flick) were presented with the unenviable task of recreating a cinematic miracle and finding a means of continuing the story without it feeling like an opportunistic rehash job. 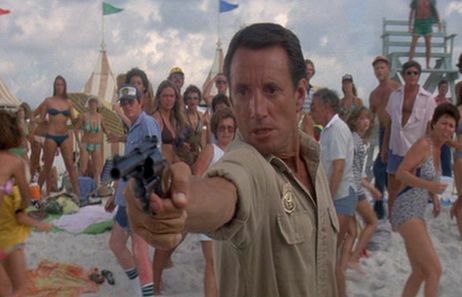 While Roy Scheider – who was under contract with the studio – would be reprising his role as Brody, alongside supporting players Murray Hamilton (Mayor Vaughn), Lorraine Gary (Chief Brody’s wife Ellen) and Jeffrey Kramer (Deputy Hendricks), Richard Dreyfuss would, regrettably, not be joining the party. However, the real conundrum was in determining who best to pass the directorial reigns over to. Spielberg was rightly dismissive towards cranking out a sequel (and probably terrified of having to go through another hellish production on the open ocean) and h ad instead set his sights on the skies with Close Encounters of the Third Kind. Hoping to strike gold a second time, producers Richard D. Zanuck and David Brown cast their eyes back towards Spielberg’s old television stomping grounds, handpicking French helmer Jeannot Szwarc – another veteran of shows like Night Gallery and Columbo – to make the pilgrimage to Martha’s Vineyard and pilot their clunky ill-tempered mechanical fish. The team’s resulting effort, Jaws 2, was released on June 16th, 1978 and became a solid – if somewhat underwhelming – hit, grossing just over $81 million at the domestic box-office and north of $100 million dollars overseas. For my money, Jaws 2 is best viewed as a glimpse at how the 1975 original might have turned out had it been handed over to a less gifted and ambitious helmer than Spielberg. It’s not a bad film by any stretch – In fact, it has a number of genuinely fantastic moments – but, outside of John Williams’ impeccable score, there’s no pulse-quickening dramatic punch, rich characterization or grueling tension to the proceedings. Rather, this second Jaws is a fun, lightweight B-movie with a slightly higher – albeit infinitely less gory - body-count, a handful of nice locations, an endearing movie monster and a compelling performance from lead Scheider, who affords the material an almost unthinkable level of integrity. Although it’s doubtful many ticket-buyers sincerely considered swearing off swimming upon exiting the theatre, they likely also weren’t cataclysmically disappointed. The film opens on a nice nostalgic note, with a duo of anonymous scuba-divers exploring the sunken wreck of the Orca in search of Poseidon only knows. Unfortunately for them, just as they begin goofing around and taking dorky muscle-man photos of each other another great white happens upon the scene and gnaws them into the afterlife via a really confusing, badly assembled montage. 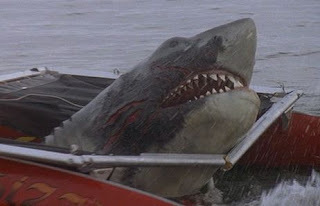 Then, apparently not satiated by its neoprene-clad lunch, the shark decides to make short work of a female water-skier. So far so good. But the fish bites off more than it can chew (*giggle*) when it attempts to devour the boat-driver, who turns out to be a complete and utter moron. Her hysterical defense against the shark, you ask? Well, she douses herself in gasoline and fires a flare-gun at her toes, of course. It sort of works too, as she avoids being consumed and actually torches the left side of her attacker’s face. The downside: she’s blown to ever-lovin’ smithereens. You can’t win ‘em all, I suppose. 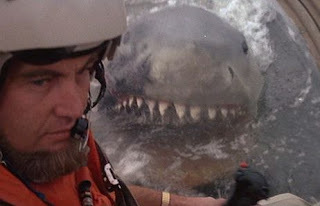 Yep, it’s shark season in Amity again, but will anyone notice other than the paranoid Chief Brody? Not content to make Murray Hamilton’s character the sole doubting Thomas this time around, the film introduces a new antagonist, developer Len Peterson (Joseph Mascolo), a cigar-chomping blowhard who’s a lot like Mayor Vaughn, only uninteresting. He has complete rule over the island, for some reason, and is resistant to the police chief’s obsessive rants about shutting down the beaches and gathering a hunting posse (“I don’t intend to go through that hell again!”). There’s real estate to sell, people! But after Brody freaks out on the beach and begins firing his weapon at a school of bluefish, and crashes a council meeting with uber-vague photos of the beach-goer-swallowing leviathan, he’s forced to turn in his badge, cop movie style. Redemption doesn’t take long to arrive, though, when the local teens, including Brody’s sons Michael (Mark Gruner –a charisma-deficient Jim Carrey clone) and Sean (precocious ragamuffin Marc Gilpin, who has a sweet moment picking up his dad’s shell casings after his volatile false shark alarm), head for the high seas in their dinky sailboats in search of adventure. Let’s just say they find it, and it’s hungry, and disgraced former-chief Brody must once again brave the water and summon up the courage to take part in an explosive mano-e-fisho-to-the-finish. 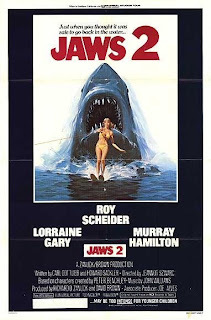 Certainly, it’s easy to kid Jaws 2’s fairly by-the-books plot, which hits all the notes you’d ever expect, but Gottlieb and Sackler do deserve credit for allowing the story to unfold gradually and with enough human drama injected to prevent the film from feeling crass and wheezy. Scheider has a few indisputably great scenes, such as his aforementioned spazz attacks, as well as a touching drunken post-firing chat with his concerned wife and Deputy Hendricks. Even though the shark never feels anywhere near as menacing of omnipresent as in Spielberg’s film, I appreciate that, rather than revisiting the same environments, the duo decided to use their attack scenarios to further explore Amity’s water-culture, with generous sections given to depicting diving (perhaps a little too much of this one), skiing, parasailing and boating. It’s a nice touch that goes a long way towards staving off been-there-done-that syndrome. For his part, Szwarc does a pretty decent job of keeping the momentum going and making the story flow like a natural extension of the first picture. Amity and its occupants look and feel almost the same (I really dig the lovably square High Sc hool “Scholarship Fund Opening Ball” scene at the beginning. Also, bonus points for the yellow shark barrel in Brody’s front yard! ), and are deliberately lit and shot in almost the exact same unassuming palette as the original. The director also does serviceable, but not spectacular, work with his carnivorous star, developing some new methods of capturing the shark in action – such as a nifty POV from astride the creature’s back – without exposing the mechanism’s restraints too badly (there are a couple wonky moments in the third act that I can forgive due to the beast’s effective and awesome electrified send-off). Less convincing, though, is the grainy stock shark footage intercut into the action (complete with thin black burn lines running from top-to-bottom), a few segments of which were also previously used to far better effect in Jaws. What truly prevents Jaws 2 from being anything other than a slightly above-average genre entry, though, is that it never feels like it’s playing outside of the long-established rules of Hollywood filmmaking. 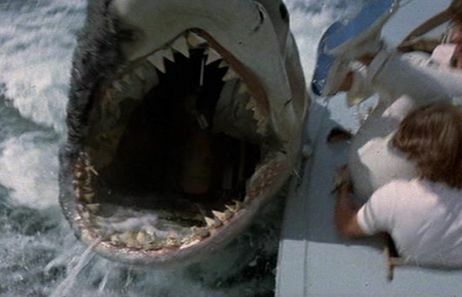 Whereas “Jaws” introduced us to characters that felt convincingly realistic and human, the players in the sequel operate almost solely on movie behaviour and logic. It makes little sense for Mayor Vaughn to be as pig-headed as h e is, given the fact that a handful of people have gone missing, a dead, half-eaten Killer whale has washed ashore, and the area has a well-documented history of high-profile shark attacks. You’d think he’d at least respect Brody enough to order a survey or something. And don’t get me started on the bitchy marine biologist (Collin Wilcox) who behaves so stereotypically dunderheaded that it’s infuriating. Plus, the gaggle of teens (one of which - Keith Gordon - I suspect was hired solely for his resemblance to Spielberg) who drive the story at a certain point feel too “Archie and the gang” one-dimensionally wholesome to be viewed as sympathetic victims. They’re mostly shark-fodder, although Donna Wilkes, as Jackie, is believably panic-stricken and pretty, heroic Marge (Martha Swatek) has the only truly terrifying demise. Ultimately, the best compliment that can be given to Jaws 2 is that it’s a breezily entertaining, well-acted funhouse experience that in no way desecrates or needlessly exploits the original film (*Cough* Jaws the Revenge *Cough*) in order to cu t corners. It’s also easily the best popcorn flick Jeannot Szwarc ever made – not an extraordinary feat, given that he followed this up with “Supergirl” and “Santa Claus: The Movie” – and by far the most admirable of the sequel attempts. Just three short years after the Universal-produced original had shocked the world into an enthusiastic frenzy, Jaws 2 proved that there was still a tiny bit of life left in the trusty ol’ eating machine and that going into the water a second time would not be without its modest rewards. Shark-tality Count: 8 – Two divers, Terry the waterskiing babe and her female boat-driving accomplice (a technicality, as stupidity is her actual cause of death), Eddie Marchand, bearded helicopter pilot, Marge. Best Toothy Kill: Marge’s self-sacrificing trip down the shark’s digestive tract. 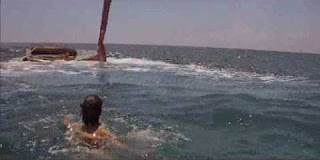 Whereas the majority of Jaws 2’s victims are essentially filler characters (or, at worst, non-descript extras), Marge’s cruel end, which occurs after saving lil’ Sean Brody’s hide, is the only death which feels in any way impactful. It’s also aided immensely by a doom-drenched John Williams musical cue. Worst Toothy Kill: The bearded helicopter pilot, for two reasons. Firstly, the concept of a shark dragging down a helicopter is absurd and laughable. Then we don’t even get to see the dude ferociously masticated. Lame. How the Shark Finally Bites It: Flossing with a high-voltage cable.